An ankle fracture is a very common injury where one or more bones (those that make up the ankle joint) break. It can involve anything from small bone cracks to severe breaks that pierce the skin. Sometimes, the ligaments may also be damaged worsening the injury. Some ankle fractures are not that severe and may only require non-surgical treatment such as casting and rest, but severe ankle fractures may require actual surgery. Ankles are prone to injury since the feet and ankles contain more than one-quarter of all the bones in your body and they support the entire body. Ankle fractures are often caused by rolling or twisting of the ankle, tripping or falling or during sports activities, and motor vehicle accidents. What Are The Symptoms Of Ankle Fractures? Following an ankle injury, it is important to have the ankle evaluated by a specialist for proper diagnosis and treatment. Your doctor will base the diagnosis on the injury history and physical examination of the ankle. Based on an initial evaluation, your doctor may order X-ray, CT scan or MRI scan of the injured ankle to determine the extent of the injury and the proper treatment. The treatment for an ankle fracture can be nonsurgical or surgical depending on the symptoms, overall patient health and severity of the ankle fracture. A non-surgical fracture treatment normally involves immobilization to a certain degree of the fractured ankle (casting). However, if the bones are displaced and unaligned, surgery is recommended. The goal of an ankle fracture surgery is to manually place the fractured bones in proper alignment and to stabilize them through the implantation of plates, rods, screws or wires in order to ensure proper position during the healing process. 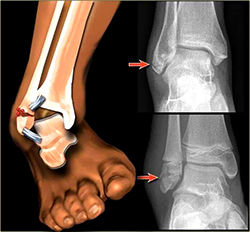 The type of ankle fracture procedure depends on the location and severity of the fracture. Following a fractured ankle surgery, patients will most likely need to wear a cast to ensure that the ankle bones heal properly and aligned. In most cases, an ankle fracture repair surgery can be done on an outpatient basis allowing patients to go home the same day, thus decreasing the risks of potential infection rate associated with inpatient hospital stay. At Spine & Orthopedic Center, our foot and ankle surgeons have experience in providing care on an outpatient basis.